Looks like during his breaks from chiding Donald Trump, Arnold Schwarzenegger is still making movies; it's just too bad few have looked good. Killing Gunther is no exception. 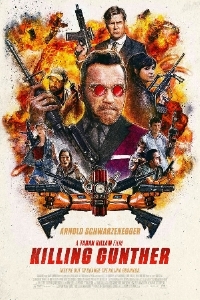 Directed by actor-turned-director Taran Killam (who also wrote the movie), Killing Gunther stars Schwarzenegger as the titular Gunther, the world's best hitman but also the most loathed by fellow professionals in the murder-for-hire industry. As such, a group of eccentric assassins decide its time to take Gunter out but one after the other, they fumble the job and Gunter always seems to come out on top. Comedy ensues. Or is supposed to ensue. I'm not convinced it actually does. Along with Schwarzenegger, the movie also stars Cobie Smulders, Bobby Moynihan, Steve Bacic and Allison Tolman. The first trailer doesn't feature a lot of Schwarzenegger which makes me think that he didn't spend a whole lot of time on set which leads me to wonder just what the producers promised to get him to appear in the movie because it doesn't look particularly funny though Schwarzenegger does look like he's having a good time. Killing Gunther does not currently have a release date.